The console-size gaming PC will launch next month for a starting price of $1500 USD. The original MSI Trident launched late last year in time for the Holiday rush as a PC alternative to the PS4 or XBox One. While its raw GTX 1060 graphics performance is indubitably more powerful than what Sony and Microsoft currently have to offer, the model is ultimately limited by its 230 W external PSU. PC enthusiasts will find that upgrading the internal GTX 1060 to the GTX 1070 is not recommended due to power constraints. 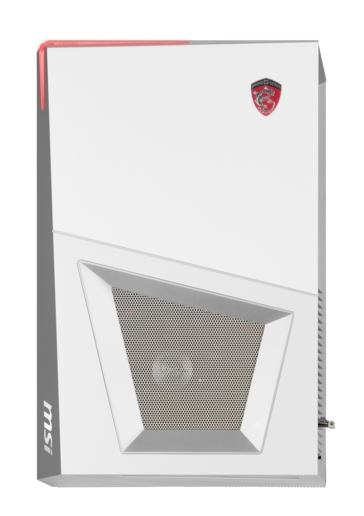 The new MSI Trident 3 Arctic solves this bottleneck head-on by upping the external PSU from 230 W to 330 W. This allows the system to sport up to a GTX 1070 without any changes to the chassis design or size. Its CPU, however, will likely still be limited to 65 W LGA 1151 processors, so the overclocking headroom of K-class solutions will not be nearly as impressive as proper ATX builds. Additionally, chances are high that the system will run louder and warmer than the original Trident 3 as it is packing more performance without any volume changes. The Trident 3 Arctic will launch this April for $1500 USD in a limited edition White chassis. Features, ports, and dimensions are otherwise identical to the existing Trident 3. 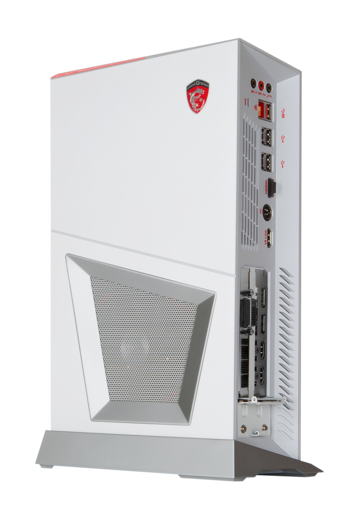 City of Industry, Calif. – March 28, 2017 – MSI, world leader in gaming hardware, launched the Trident 3 Gaming PC at the beginning of this year. Praised by media and awarded with an IF Design award, MSI is announcing a chilled limited edition of their highly-awarded gaming PC, the Trident 3 Arctic. With its icy white color, it provides a cool look to every gamer’s battlestation. The Trident 3 Arctic also gets a big performance upgrade. It houses a customized GeForce® GTX 1070 graphics card and uses the latest Intel® Kaby Lake processor to get performance levels far above its similarly-sized console counterparts. 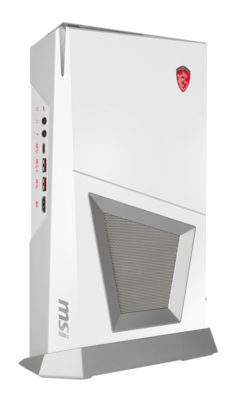 The MSI Trident 3 Arctic is the pinnacle of small form factor, but does not compromise on high performance PC gaming. Whether in a VR environment or simply on the couch with friends, gamers are sure to enjoy smooth gameplay with the MSI Trident 3 Arctic. Trident 3 Arctic features a customized MSI GeForce® GTX 1070 graphics card in ITX format, which outshines any ITX reference cards found in other small form factor PCs. Gamers can now enjoy the best in-game performance on a console sized PC. MSI crafted a unique way to keep the system as cool and quiet as possible by individually cooling the most important heat-generating hardware in the system using separated chambers. When performance really matters, Trident 3 Arctic is up to the task and delivers powerful gameplay without annoying gamers with a noisy fan or overheating hardware. For those who like to add a little personal touch to their system, MSI Trident 3 Arctic features RGB Mystic Light. By using the Mystic Light App or MSI’s Gaming Center software, gamers can instantly change the color and effects of the front LED lights on the system to show their mood. The MSI Trident 3 Arctic will be available at the beginning of April at Newegg, Amazon, Microsoft.com and Fry's for $1,499.99. As a world leading gaming brand, MSI’s goal is to become the most trusted name in gaming and e-sports. We stand by our principles of breakthroughs in design, the pursuit of excellence, and technological innovation as we have continued to raise the bar for ourselves and have accomplished a great deal of pioneering work in the industry. For more product information, please go to www.msi.com.